William Squire began making locks on their present site in the mid 18th century and by the time his son, Thomas, joined him his locks were well known enough for the company to be recognised as such and the date 1780 marks the recognition of this fact. The late 18th century saw the Industrial Revolution growing rapidly and the advent of the Napoleonic Wars added to this growth, in which Williams's company benefited from the increased demand for locks. Wealth was spreading throughout the population and with it came a higher standard of living, the ownership of property and furniture, all of which required locks on a previously unknown scale. By the end of the 19th century the company, which had used all its available land to build new factory space, bought an adjacent three-acre field on which it built a new factory to supply the increasing demand for its products. Its main products were door locks, padlocks and furniture locks, the latter providing most of its income. The First World War (1914-1918) saw it manufacturing munitions. After the War great changes took place in the furniture industry. Plywood began to replace solid timber in furniture, which reduced demand for mortise furniture locks because they could not be mortised into plywood. Germany began to subsidise its industries, including lock making, and could land locks in England at the same prices as the raw material cost of the company's products. The search for new markets led the company to develop its long established padlock range, as well as adding new hardware products to replace the rapidly declining furniture lock production. A new factory was built in 1937. The Second World War required the company to make precision gauges, machine gun links and torpedo parts, as well as some padlocks. After the war, the company expanded its padlock range and added bicycle and motorcycle locks and accessories, as well as hardware products. 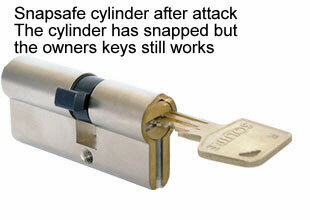 Squire Snapsafe Cylinders for uPVC doors. 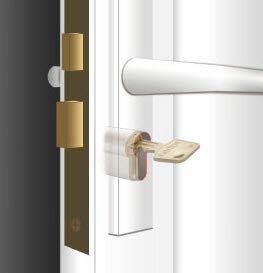 Break-ins involving doors fitted with euro-cylinders are on the increase and constant demands from victims and crime reduction authorities for a solution have been met with the introduction of the Squire Stronghold® SnapsafeTM cylinder. The Squire design team came up with a simple modification to a standard cylinder. This realistically accepts that a cylinder, when subjected to a physical attack, can break but that it should break without nullifying its security. As the name suggests it snaps safe. 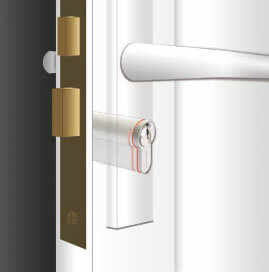 As the illustration shows the cylinder will snap at a pre-selected position leaving an in-built security zone inside the door furniture of the door with at least three active pin chambers. The would be thief is now faced with taking more time to pick the lock and invariably will give up. In most instances, even after the attack, the key holder will still be able to open the lock. 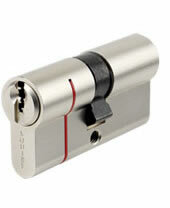 The Snapsafe security cylinder is available on all lengths including single, doubles and thumbturn. Another problem associated with Euro cylinders is that of 'bumping'. This is a method were the attacker uses a specially cut key and taps the key into the cylinder quickly whilst turning the key in order to bump the pins in the lock to the open position. There is a lot of luck associated with this technique as well as the attacker having to have the correct shape of ky and also have it cut to the right heights. However, the Squire Snapsafe security cylinder has bump resistant pins giving the cylinder addtional protection from cylinder bumping. There has been a lot of talk regarding euro cylinders on pvc doors being broken by burglars in order to gain entry to a property as shown on TV and in the newspapers recently. There are however, a few points to note. Firstly, although the technique has been known for some time by some locksmiths, so far, there have been few break-ins using the technique, so there is no need for immediate panic. However, it was felt by some locksmiths that there was a 'duty of care' to take into consideration, in that if no one was warned of the possibility of entry being gained by the technique, then they would not be able to protect themselves from the problem – hence the recent publicity. The technique can be learned very quickly, is very quick to execute, and does not require specialist locksmithing tools, although a cylinder snapper can be purchased by anyone from a number of sites on the web. It can be used on both high quality and inexpensive ranges with equal effect. A product is available to 'enhance' the security of these cylinders when fitted with handles. Made by Squire, the product attaches to the cylinder and is located under the door handle. However, the additional security offered depends entirely upon the strength and quality of the handles which are fitted. Many older or cheaper handles do not have the strength or thickness of metal required to make the cylinder properly secure. In many cases, it will therefore be necessary to buy and fit a new pair of handles to work with the enhancer in order to ensure that you are offered the best security possible. What is a cylinder snapper? It is a tool which is made to snap a door cylinder it half with very little effort and very little noise. With the cylinder out of the way, there is nothing to stop your door from being opened with little more than a screwdriver. However, there needs to be at least 7 or 8mm of cylinder to be sticking out to be able to hold on to the cylinder in order to snap it.